Henri Lebasque was born in Champigné in the Maine-et-Loire department in western France. After graduating from the École des Beaux Arts in Angers, he became an apprentice in the studio of the painter Léon Bonnat (1833 –1922), while befriending Vuillard and Bonnard, founders of the Nabis group (“the Prophets”), as well as the Neo-Impressionists Paul Signac and Maximilien Luce, who all left their mark on Lebasque’s painting style. 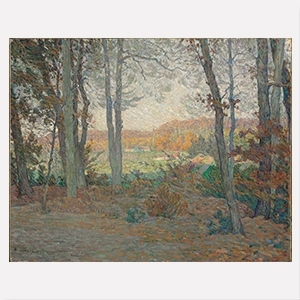 With regards to subject matter, his earlier work shows influence by the Intimists, concentrating mainly on calm domestic scenes; technically, he adapted the Divisionism of the Neo-Impressionists. Along with his friend Henri Matisse Lebasque founded the Salon d’Automne in 1903. By 1912, the salon exhibited works by Les Fauves (“Wild Beasts”), and gradually Lebasque’s style changed towards more flatness and a brighter palette. In 1924, the artist moved to Le Cannet on the French Riviera, where he frequently worked with the artists Manguin and Bonnard. He died there in 1937. Known as “painter of joy and light”, Henri Lebasque`s artwork can be found in many important museum collections, including the Musée d’Orsay, Paris, and the Thyssen-Bornemisza Museum, Spain.